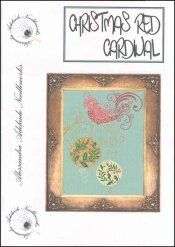 Christmas Red Cardinal [H5512] - $16.50 : Yarn Tree, Your wholesale source for cross stitch supplies. Cross stitch pattern from Alessandra Adelaide Needleworks. An elegant looking cardinal sits on a golden branch decorated with two ornaments. Stitch count 198w x 253h.